The Model 650 Low Speed Diamond Wheel Saw is a compact, multipurpose, precision saw designed to cut a wide variety of materials with minimal subsurface damage. It's low speed makes it possible to cut fragile materials that would otherwise fracture and soft materials that would load the diamond wheel on a higher speed saw. Single-Axis Goniometer -The Model 65001 has a graduated scale with a 0.2° vernier and can be rotated 360°. This rotational capability makes it ideal for precisely slicing single crystals. The sample is mounted to a block using a low melting point wax and the block is subsequently clamped into the Model 65001. Wax mounting of the sample ensures that the cut piece will remain attached to the holder and will not be damaged by falling after being cut. Double Clamp Sample Holder - The Model 65003 is a clamp type holder designed to clamp both ends of a round or rectangular rod while cutting between the two clamped positions. The Model 65003 can also be used as a single clamp holder to hold encapsulated metallurgical samples up to 1.25" in diameter. This Model 65004 Petrographic Sample Holder uses vacuum to hold 1 in. x 2 in. petrographic microscope slide with a petrographic sample cemented to it. The sample can be aligned with the diamond wheel on the Model 650 to cut a thin sample. 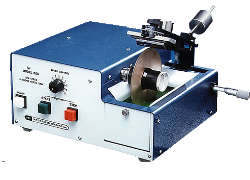 2-Axis Goniometer - When the Model 65005 is used with the vernier on the Model 650, the combination is a 2-axis Goniometer. The Model 65011 track mount is for holding Model 65005 2-axis Goniometer for x-ray or optical orientation. The Model 65006 Vise Holder is used for holding odd shaped samples that can be held with a vise. The Model 65007 Right Angle Holder for holding sample at right-angles to wheel, using the same mounting blocks that are used on Models 147, 150, and 155 lapping fixtures (or any mounting block that has an 8-32 thread). The Model 65012 Dressing Stick Holder is used to rigidly hold dressing stick when moving it into the diamond wheel to expose fresh diamonds, instead of risking damage to the wheel when holding it by hand. The Model 65040 Sample Alignment Microscope is used to align where a cut is to be made using a monocular microscope with a 4 in. working distance and cross hairs.